Dr. Palma's research focuses on using precision radiation to treat cancer, new imaging techniques to detect cancer, and quality of care. The picture on the left shows precision radiation being used to treat a lung cancer. Dr. Palma has authored or co-authored more than 100 peer-reviewed cancer research articles. You can read some of them here. (This link opens a list in the Pubmed search engine). He co-leads the Baines Imaging Research Lab, and is chair of the Canadian Pulmonary Radiotherapy Investigators (CAPRI) Group. The ORATOR study, an international trial comparing robotic surgery vs. precision radiation for cancers of the throat. 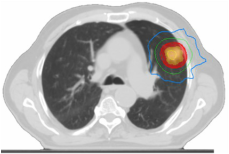 The MISSILE trial, evaluating the use of precision radiation before surgery for early lung cancer.